Discussion in 'General Hardware Discussion' started by DogMan, Jun 3, 2015. If you have a drill press or dremel, any atomizer can be converted to bottom feed by either drilling the positive post both through the 510 connector and horizontally at base level [to drain], or by dremeling channels down the side of the positive pin. The A6 atomizer, which retails for $6 is a reomizer3 without BF modifications. If you prefer a regulated device, either for peace of mind, or more power. The geyscano 50 watt mod retails around $70 USD. This mod was designed in australia, manufactured in china. Outside that prices go up exponentially. VW squonking is popular in Italy, the majority f the models have waiting lists and $300+ price tags. Some beautiful mods in stabilised woods. If you are on facebook, the group titles "squonkers" run by Ken Fair has many of these for sale and trade. It is a good place to explore Italian VW options, including temperature control. "Squonkers" is a private group, but open entry, Ken will generally just check your profile for a vaping related post to verify you. vapinart.com also sells selected bottom feeders. For the dinosaurs among us, those who use mechanical mods for whatever reason, but find the performance of a REO's thin contacts limiting, custom modders are generally the best point of call. Two prominant modders can be found on ECF in pdib and tbev. 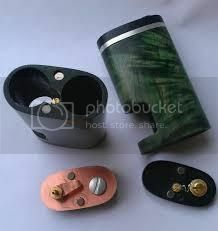 Pdib's wooden mechanical squonkers have no official name, but affectionately get termed "dibbi" "sumpin'" or "OliveR". The waiting list is currently 2+ years. Tbev manufactures a few mods, the tmod and the jmod. The tmod is mechanical, in alloy metals including aluminium, bronze, and brass. At the time of writing, turn around is 4-6 weeks. So in summary, if you are just looking to get your feet wet, go with a chinese manufactured cheapy mod. If you like it, get on a list for either a mech out of the USA, or a VW/temp control out of Italy. Or just buy a reo, knowing resale value is good if you don't take to it. As stated, any RDA can be converted. Choose one that suits your style of vaping. Much more practical than dripping, particularly while driving. margyb, rupert, emu and 10 others like this. I'm still really pissed that I missed your epic PIF! Catweazle and DogMan like this. Not that epic. I didn't like it, would feel bad charging for it. Hey thanks for that, I've always been a bit curious about them. The look cool and from what I hear have awesome flavour. Can you buy extra bottles for them? And do they use lots of juice? I think I might have to get me self a cheapie Chinese one and have a play. OK so is juice consumption similar to what you would normally use? I won't say no if it's a paperweight, I'll see what I can do with it. From memory pcans boxes have a fair bit of meat on them.........I might even be able to get a board in it! I think this is a very worthwhile tutorial. The first of many I'm sure. I do have a Smokeless Owl one incoming just to see what all this squonking is all about. Browny and DogMan like this. Mine arrived this morning. Looks ok for the price . Will clean and try it out over the weekend. There is also a pre-order for a reo grand clone at. At $30 US it's another china see if you like squonking mod.